François Hollande has been elected president of France with 51.7 percent of the 35 million votes cast in Sunday’s election. His opponent Nicolas Sarkozy received 48.3 percent of the national vote. Mr Hollande is the first Socialist president since the end of François Mitterrand’s second term in 1995. Nicolas Sarkozy, who has been president for the last five years, said it was a new turning point for France. “I bear all the responsibility of this defeat,” Nicolas Sarkozy said. Mr Hollande was gracious to his vanquished opponent. “I send the Republic’s greeting to Nicolas Sarkozy who deserves all our respect,” Mr Hollande said. French people will be closely watching the new president’s performance and the extent to which he keeps his promises. “The change I propose to you must measure up France. It begins now,” Mr Hollande said. The right-wing opposition is preparing legislative election in the hope of not losing the government’s majority. 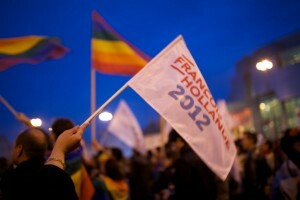 France’s legislative election will be held on 10 and 17 June.